NEVER AGAIN! Never again does a horse need to suffer the horrendous fate of dying alone because help was asleep or unaware of their condition! NightWatch 24 remotely monitors your horse and alerts you at the first sign of danger! How Did NIGHTWATCH® Come To Be? In 2013 Jeffrey Schab―Founder & CEO of Protequus LLC―and his partner ,Wade Giles, lost their beloved horse, Snoop, to a rare colic event overnight. Snoop lived just a short 8 years and died alone in his stall. Immediately following Snoop’s death, Jeffrey was driven to make a difference. His sense of loss was paralleled only by his frustration with the status quo and perceived complacency in the industry regarding equine colic. Jeffrey vowed to not let Snoop's death be in vain, and immediately began to invent a solution that could prevent others from experiencing the same pain that he and Wade did. That solution will become what we know today as NIGHTWATCH®. As a two-time World's Champion equestrian and biomedical engineer with 15+ years of experience in human healthcare, Jeffrey is pioneering a path that bridges his professional expertise with his personal passion. It’s with great pride and respect for our four-legged friends that he leads the NIGHTWATCH® program. Snoop remains a powerful inspiration and motivation for both Jeffrey and Wade. It is in his memory that NIGHTWATCH® exists to provide critical first alerts for early intervention, ultimately to help save horses' lives. What Would You Give To Be There When Your Horse Needs You? Most of us would give anything to rush to the aid of our horses in need. Equine distress can present in many ways and stem from many factors including injury, trauma, illness, fear, and boredom. There are a number of common equine distress conditions including colic, casting, and foaling that can negatively impact your horse and result in serious injury or death if not detected and addressed early. So, What Can Horse Owners Do To Protect Their Horses? NIGHTWATCH® Is The Answer! NIGHTWATCH® is the World’s first equine distress & wellness monitor (patent pending) designed to alert caretakers via SMS/text, phone call, and/or email at the early signs of danger and distress, such as colic or being cast, and offered in the form of an all-leather smart breakaway halter or safety collar. This revolutionary biomedical device continuously monitors real-time data on your horse’s vital signs and behaviors, works across cellular and Wi-Fi networks, offers GPS tracking, uses wireless inductive charging, and adapts to your horse over time as the system learns their unique and normal patterns and parameters. All technology (eg, sensors, microprocessors, transceivers, batteries) is non-invasively embedded within the padded leather crown of each halter/collar making NIGHTWATCH® safe and comfortable for long-term use on horses in a variety of conditions. Insight to real-time and historical information, including a horse's Equine Distress Index (EDI™) score, is available on-demand 24/7 via an intuitive smartphone application and web dashboard. NIGHTWATCH® uses a variety of sensors to collect continuous real-time data on a horse’s vital signs and behaviors as they wear the halter/collar, while advanced software logic analyzes this data and computes a quantifiable measure of relative distress (ie, Equine Distress Index [EDI™] score) on a 10-point scale. When a user-defined threshold of distress (ie, EDI™ score) is reached, the system sends a wireless alert to caretakers or others via SMS/text, phone call, and/or email simultaneously or in a cascading fashion until the alert is acknowledged. NIGHTWATCH® uses novel radio frequency technology (ie, ultra-wideband impulse radar [UWB-IR]) to monitor a horse’s heart rate and respiratory rate, the two most important vital signs that correlate with acute equine distress/trauma. UWB-IR technology works much like sonar whereby sensors measure the physical displacement (ie, expansion and contraction) of the microvasculature around a horse’s poll (ie, area behind their ears) for heart rate, while also assessing physical changes in the soft tissue of their upper respiratory region for respiratory rate. NIGHTWATCH® uses a variety of sensors, including accelerometers, gyroscopes, compasses, and altimeters to constantly assess a horse’s activity, motion, and posture. More specifically, NIGHTWATCH® identifies and flags (for evaluation) first-time novel events that may be indicative of distress along with known movements that likely correlate with distress such as pawing, kicking, flank watching, repeated rising/falling, extended periods of time lying down, violent rolling with/without thrashing, etc. Can NIGHTWATCH® Actually Learn About My Horse As An Individual? Yes! 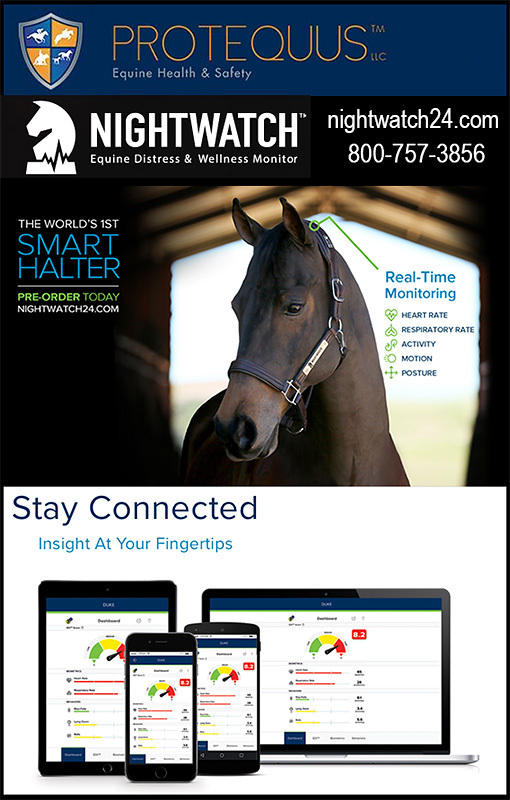 NIGHTWATCH® is smart, which means it has technology that actually learns your horse’s “norm” (ie, biometric parameters, behavioral patterns) and adapts to them. Over time the system determines what good and normal looks like in your horse, thereby detecting unusual or novel events that may be early signs of distress. The more your horse wears NIGHTWATCH®, the more precise and fine-tuned the system becomes. When distress is detected, NIGHTWATCH® sends a wireless alert notification to a caretaker or others via SMS/text, phone call, and/or email. The system will continue to send these alerts simultaneously to multiple people or in a cascading fashion (user configurable) until the notification is acknowledged. In addition, LED indicators on each NIGHTWATCH® halter/collar offer a visual reference of a horse’s relative distress state. Just look for the green indicator for reassurance your horse is within their normal and non-distress state. Do I Need Wi-Fi In My Barn For NIGHTWATCH® To Work? No, you do not need Wi-Fi in your barn for NIGHTWATCH® to work. Each NIGHTWATCH® halter/collar is equipped with cellular technology (in addition to having the ability to connect to a Wi-Fi network) that allows you to stay connected to your horse whether they are at home, on the road, or away at a show/competition anywhere in the US and Canada. Having integrated cellular and Wi-Fi technology is very important and unique versus other equine wearable devices in development that rely exclusively on Bluetooth technology. The biggest limitation to these Bluetooth devices is the requirement for you to be within site distance of your horse…this is impractical for overnight monitoring when you are not with your horse, not to mention severely limited when your horse is turned out or in transit. NIGHTWATCH® is powered by several rechargeable lithium-ion polymer (LiPo) batteries, which are the same batteries found in many consumer electronics such as mobile phones and tablet computers. Will NIGHTWATCH® Work With Broodmares Who Are About To Foal? Yes, a foaling algorithm is in development and anticipated to be available for the 2017 foaling season. In the interim, NIGHTWATCH® can still be used on broodmares because the system will detect changes in their biometrics, which is observed in 85-90% of broodmares during foaling, as well as changes in their activity, motion, and posture. Each NIGHTWATCH® smart device is adaptive and conforms to one particular horse over time. To maximize precision and benefit, proprietary algorithms are continuously being updated as each NIGHTWATCH® halter/collar learns your horse’s unique biometric parameters and behavioral patterns. Therefore, we do not recommend interchanging any NIGHTWATCH® halter/collar among multiple horses. However, if you do have a need to transfer a device between horses, system parameters can be reset and historical data transferred. Will NIGHTWATCH® Still Work If I Have A Limited Cellular Coverage Area? We recognize, there may be some areas in the US and Canada with limited cellular (3G) coverage, but this will not affect the functionality of NIGHTWATCH® in most cases. NIGHTWATCH® analyzes all data at the point-of-care (ie, on your horse), which means most of the time there is no need to activate or transmit data across cellular or Wi-Fi networks. Data transmission only occurs when there is an alert or when someone requests a status update; off-loading of historical data and system updates occur while the device is off your horse and being charged. For areas with insufficient 3G cellular data coverage, we recommend you have NIGHTWATCH™ connected to a Wi-Fi network at all times. How Much Does NIGHTWATCH® Cost? Compared to the tragedy of losing your horse, the price is trifling! Pricing starts at $699.99 and requires an annual monitoring contract and license agreement equal to less than $1/day. All costs are represented in U.S. dollars…this is a nominal price to potentially save your horse’s life! Order NIGHTWATCH® Today… Sleep Better Tomorrow! NIGHTWATCH® was developed by a fellow equestrian who lost his horse to a nighttime bout of colic overnight…without notice or warning. Determined that no horse owner should have to suffer the same grief and pain, NIGHTWATCH® was born. Smart and adaptive, NIGHTWATCH® works as a 24/7 alarm to ensure you are alerted when the unexpected happens. ORDER today!—NIGHTWATCH® is there when you can’t be.